New Year, time for a new mobile phone or so I thought instead today I endured my own Carol Beer moment. Being the cautious type I have always mitigated the risk of huge mobile phone bills by sticking to pay as you go. However looking to upgrade my handset this time around I have decided to take the plunge and get hooked up to a contract – I must start to realise I am no longer in my improvised student days. My trip to the 02 store however was less than fruitful and all because of one address, two computer systems and two postcodes. The size of my apartment building means that there are two postcodes depending upon your flat number. This has been a problem in the past however I have managed to receive post, pay bills and be located as when needs be… until it came to 02’s system for setting up new contracts. We tried multiple combinations of apartment numbers, building numbers and postcode’s but to no avail. A call to the o2 ‘command centre’ and it appears the address is not registered with Royal Mail (a later check on their website and this doesn’t appear to be the case) – the system on which o2 rely on for it’s address data, which makes perfect sense… you don’t want people saying they live in Chako Paul City after all! What about a manual override I hear you cry, because as fantastic as such systems are they can’t always account for all variables i.e. the human factor. 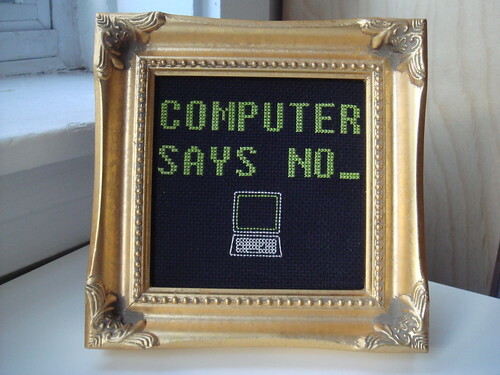 Well… computer says no!!! Leaving my only option as updating my bank details… as I think moving house might be a little extreme on this occasion. Image c/o benjibot licensed under Creative Commons.